Uncertainty in the strength of the Atlantic Meridional Overturning Circulation (AMOC) is analyzed in the Coupled Model Intercomparison Project Phase 3 (CMIP3) and Phase 5 (CMIP5) projections for the twenty-first century; and the different sources of uncertainty (scenario, internal and model) are quantified. Although the uncertainty in future projections of the AMOC index at 30°N is larger in CMIP5 than in CMIP3, the signal-to-noise ratio is comparable during the second half of the century and even larger in CMIP5 during the first half. This is due to a stronger AMOC reduction in CMIP5. At lead times longer than a few decades, model uncertainty dominates uncertainty in future projections of AMOC strength in both the CMIP3 and CMIP5 model ensembles. Internal variability significantly contributes only during the first few decades, while scenario uncertainty is relatively small at all lead times. Model uncertainty in future changes in AMOC strength arises mostly from uncertainty in density, as uncertainty arising from wind stress (Ekman transport) is negligible. Finally, the uncertainty in changes in the density originates mostly from the simulation of salinity, rather than temperature. High-latitude freshwater flux and the subpolar gyre projections were also analyzed, because these quantities are thought to play an important role for the future AMOC changes. The freshwater input in high latitudes is projected to increase and the subpolar gyre is projected to weaken. Both the freshening and the gyre weakening likely influence the AMOC by causing anomalous salinity advection into the regions of deep water formation. While the high model uncertainty in both parameters may explain the uncertainty in the AMOC projection, deeper insight into the mechanisms for AMOC is required to reach a more quantitative conclusion. The online version of this article (doi: 10.1007/s00382-016-3180-x) contains supplementary material, which is available to authorized users. 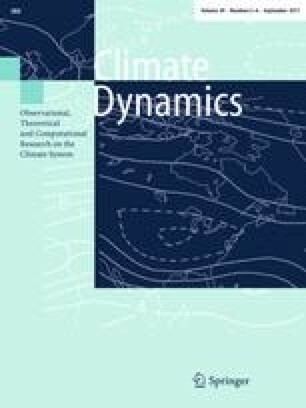 We acknowledge the World Climate Research Programme’s Working Group on Coupled Modelling, which is responsible for CMIP, and we thank the climate modeling groups for producing and making available their model output. For CMIP the U.S. Department of Energy’s Program for Climate Model Diagnosis and Intercomparison (PCDMI) provides coordinating support and led development of software infrastructure in partnership with the Global Organization for Earth System Science Portals. This work was supported by the RACE II Project of BMBF (Grant Agreement No. 03F0729C) and the European Union FP7 NACLIM project (Grant Agreement No. 308299). N. K. acknowledges support from the Deutsche Forschungsgemeinschaft under the Emmy Noether-Programm (Grant KE 1471/2-1) and the NFR EPOCASA project (Grant 229774/E10), and PREFACE project (EU FP7/2007-2013, Grant Agreement No. 603521), and the ERC project (Grant Agreement No. 648982). The NorESM simulations utilized the NoTur/NorStore (NN9039K, NS9039K).